A white-knuckle ride through a world of corruption, cruelty and violence… Mapping the minds of murderers is what Dr Tony Hill does better than anyone. So when a twisted killer starts targeting psychologists across northern Europe, he’s the obvious choice to track the executioner’s mental and physical journey. Except that Tony doesn’t want to do this any more. But the case is about to come uncomfortably close to home. The next victim is a friend of his. And his former partner, DCI Carol Jordan, is herself in Germany, working undercover in a world where human life is cheaper than a drugs deal. She needs his help as much as the serial killer hunters do. Confronting the worst of contemporary crime and struggling to unravel roots that lie deep in the tormented past of Nazi atrocities and Stasi abuses, Tony and Carol are forced to battle for survival against overwhelming odds. In this morass of doublecross and doubledealing, they have no one to trust but each other. Tony Hill is back. And this time, it’s personal. 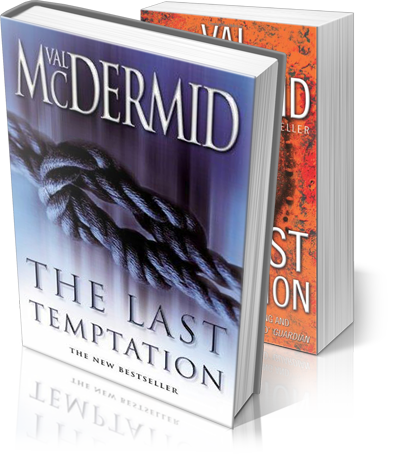 … a well-thought-out thriller… McDermid is incapable of writing badly. Val McDermid is one of the few crime authors who can be convincing when it comes to ‘writing tough’, yet retain a powerful emotional insight. … Her capacity to uncover the roots of anger and fear have never been better demonstrated than in The Last Temptation. The real legacy of the horrors of the Second World War is… the one at the heart of this book: the way in which the experience of wartime suffering is bequeathed by the victims to the next generation. … It is part of McDermid’s strength that she makes Jordan and her ‘target’ into rounded human beings with whose feelings the reader can engage, and that the love affair between Hill and Jordan is skilfully developed… Most powerful of all, and a unique voice in a novel of this type, is a low-pitched authorial rage about the crimes committed upon children in concentration camps by the very people who should have protected them… McDermid is doing something quite extraordinary with the crime fiction suspense thriller. [The Last Temptation] is a masterful examination of evil and the relics of Nazi and Stasi years in Germany. A psychologically chilling and multifaceted thriller. … With consummate skill and pacing, she braids together the complex story lines through surprising revelations, heartstopping suspense and cruel double-crosses. McDermid’s writing and her understanding of the criminal mind get better with each novel. Relentless, electric and absorbing, this is a thriller not to miss.